CULLMAN – On Saturday morning Sheriff Matt Gentry and his deputies from the Cullman County Sheriff’s Office found themselves caught in an overwhelming incident at Heritage Park. Even through the coordinated efforts that come from all the team training that CCSO deputies do, they were simply no match for the threat they faced. Sometimes you just have to face the facts: they may be great at law enforcement, but soccer’s a whole other thing. 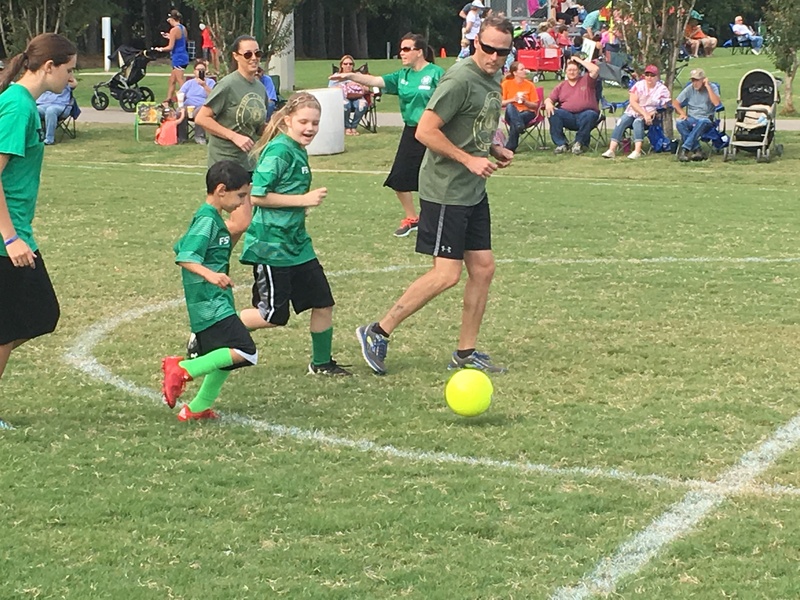 Gentry and 15 CCSO deputies joined with the American Youth Soccer Organization’s (AYSO’s) local VIP (Very Important Players!) team for its third annual exhibition match, to kick off the season for Cullman’s special needs soccer team. The VIP team is coached by Brandy Thomas and Janice Edelman. Thomas shared a little about her team. “This is Cullman’s only special needs soccer team, and we play every year, and we also play against other VIP teams. We’re always adding, so it’s constantly changing. We (recently) added, I think, two new in north Alabama; so we’re up to four or five in north Alabama. “This is my third year as coach and administrator of VIP, and this is actually the fourth year for the VIP soccer program here. This is our third annual exhibition game; we call it an exhibition, because this is our first game of the year. We get to show off our skills, and the cops come out here and do what they do best, and give support to the kids. Thomas shared the history of the exhibition game. The match began with a liberal amount of all-in-fun, family-friendly trash talk between the competitors, as they sized each other up across the midfield line. But when play started, it was almost all VIP: the deputies struggled so much, it looked at times like they actually wanted their opponents to win. In the end, multiple scorers allowed VIP to celebrate a decisive 10-3 victory over the CCSO. Afterward, the fierce competitors became friends once again; coming together for high fives, hugs and a combined team picture. “I don’t have any kids that are special needs,” said Thomas, “but these are my kids, and they are fantastic! They’re wonderful kids, and I love them, and I hope to grow every year. I hope to get so big that I have two VIP teams. It is fantastic! For more information, visit Cullman AYSO’s website www.cullmanayso.org, or on Facebook at www.facebook.com/cullman.ayso.